View More In Cordial & Liqueur Glasses. 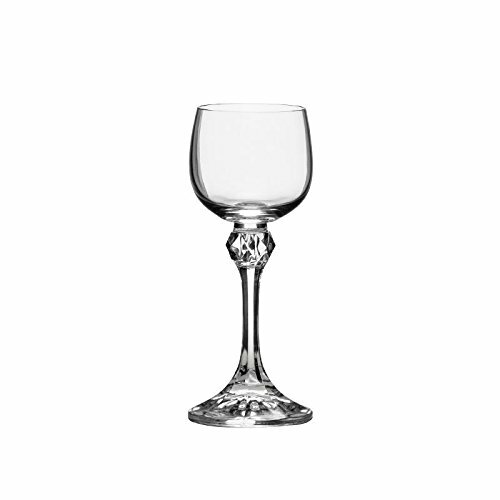 Crystalex B40428-60, 2-Ounce Julia Cordial Glass, Elegant Long Stem Liqueur Glasses, Crystal Schnapps Liquor Glass Set of 6 is introduced by one of the most reputed manufacturers in the world. This drinkware conveys mature traditions of Bohemian glassmaking craftsmanship, which dates back to the 12th century. Resistant to mechanical damage, food acids and thermal shock, it is a combination of superior utility and design. Reinforced rim and perfectly balanced proportions make it convenient to use and easy to clean. Julia collection includes glasses in sophisticated style with facetted stem and base, which would equally fit for any private or commercial drinkware set. Dishwasher safe. Made in Czech Republic. Dishwasher safe. Made in Czech Republic. If you have any questions about this product by Crystalex, contact us by completing and submitting the form below. If you are looking for a specif part number, please include it with your message.